(17/P53) TRENTON – Sand pumping and other work to better protect exposed beaches in the Ortley Beach section of Toms River is under way, marking the start of the long-awaited northern Ocean County beach replenishment project to protect coastal communities vulnerable to significant storm damage, DEP Commissioner Bob Martin announced today. Contractor Weeks Marine of Cranford began pumping sand today in Ortley Beach, which sustained catastrophic damage during Superstorm Sandy in October 2012. The work is part of a $128 million project by DEP, in partnership with the U.S. Army Corps of Engineers, to build beaches and dunes in northern Ocean County. Ortley Beach will receive approximately 267,000 cubic yards of sand that will create an approximate 125-foot-wide beach. Dredges will pump sand for approximately two weeks before moving to the Absecon Island beach and dune construction project. Work in northern Ocean County will resume in late summer, starting in Mantoloking. Weeks Marine will work in 1,000-foot-wide sections of beaches at a time to reduce impacts to residents and visitors. The company will use multiple-suction hopper dredges, which are ships that pull up large volumes of sand from offshore before maneuvering closer to the beach in order to pump sand onto the beach. The contractor also will use a cutter-head dredge, which is a large barge that sits offshore and pumps sand continuously onto the beach via a pipeline. "This represents one of the largest beachfill contracts in the history of the United States Army Corps of Engineers," said U.S. Army Corps of Engineers' Philadelphia District Commander Lt. Col. Michael Bliss. "The engineered dune and berm system will serve the vital purposes of reducing risk and helping to protect people and property." 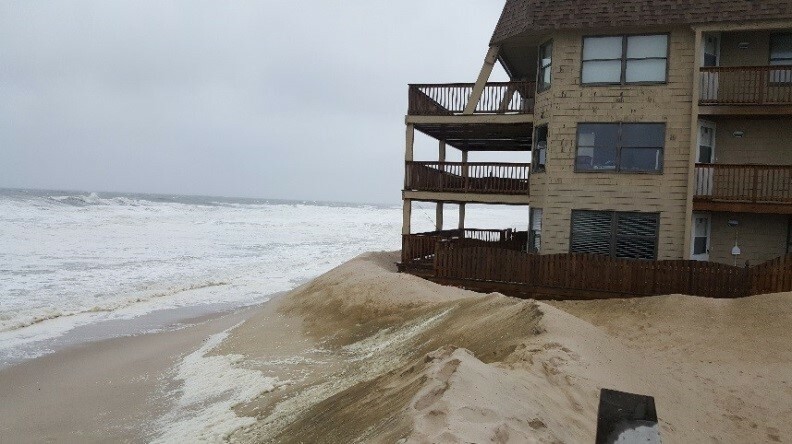 Engineered beaches and dunes absorb and reduce the impacts of storm surge while helping to protect lives, property and infrastructure. Northern Ocean County’s Barnegat Peninsula was hit especially hard when Superstorm Sandy slammed the state. The northern Ocean County project entails 11 million cubic yards of sand covering some 14 miles of coastline along the Barnegat Peninsula, protecting the communities of Point Pleasant Beach, Bay Head, Mantoloking, Brick, Toms River, Lavallette, Seaside Heights, Seaside Park and Berkeley Township. For most of this project area, dunes will be built 22 feet above mean sea level. Beaches will be constructed from 100 feet to 300 feet wide and 8.5 feet above mean sea level. The project area will receive periodic replenishment projects over the course of 50 years to replace sand lost through normal erosion. The federal government will pay for 65 percent of the project using money approved under the 2013 Disaster Relief Appropriations Act, which funds projects that Congress had previously authorized but had not been completed by the time Sandy hit. New Jersey will pay for 35 percent of the project from the state’s Shore Protection Fund.